Now that the fall school season has started, I have even less time to write without the need to turn in the next day, but I hope to occasionally be able to blog here and there, and when I do, it will be a review (I’m playing games, I swear! I just don’t seem to be getting anywhere…), or just random crap, and some of it may or may not include games. First of all, I felt like giving my thoughts on Call of Duty: World at War. The game seems fine and all, but most of the talk surrounding this game is that the developer is not called Infinity Ward (who made that one shooter you might still be playing). People were outraged (well, as outraged as a fat guy at a computer can be without causing damage) at the fact that Treyarch, devs of the sorta-lauded-but-kinda-in-a-weird-place-so-people-went-meh Call of Duty 3. I’m not going to defend the game, except for saying that even though it wasn’t as good as 2, it sure as hell was better than many shooters that came out at the time. That point aside, Treyarch really is in tough position. After making a name for themselves with Spider-man 2, then screwing up (by all intents and purposes, for not being named Infinity Ward) at COD3 and then Spider-Man 3. So, they needed something big to get people’s trust back. Judging by the image above, I think it’s safe to say they’re on the right track. Now, that looks like ordinary fire there, but see it in motion and I think you’ll at least consider changing your mind. 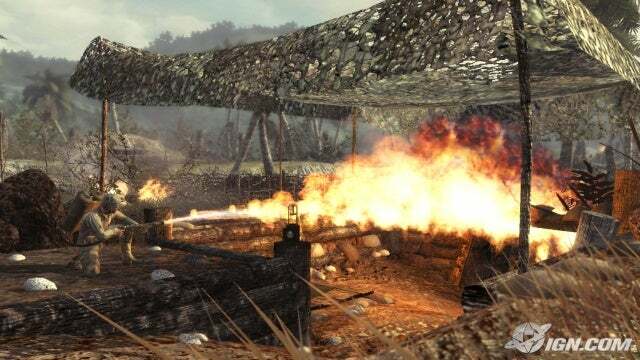 If you’ve played any games with fire (and you should have, hopefully), it always seemed to look so square and just crappy compared to its surroundings. But Treyarch seems to have nailed it. This may also be part of a trend, from what I’ve heard. Now, beautiful fire a great game does not make. They’re still in a shaky state. But I’m in a state to forgive them for whatever they’ve done in the past. And really, if you take off your stupid fanboy glasses and see the world for what it is, their sins are as heretical as you thought they were. Nevertheless, I’m going to forgive Treyarch on behalf of the gaming community. Treyarch, we forgive you. Even though we should be apologizing. And even if the game does turn out to be crappy, let it never be said that it had crappy fire. → On a (Lots of) Hair Trigger.